It's the Children's Day, let's celebrate it by introducing one of the most beloved-by-kids composers of all time. 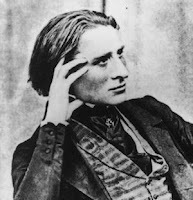 Franz Liszt might be best known for his flamboyant and bombastic showpieces, like the Hungarian Rhapsody No.2 in Tom and Jerry, or the finale of Les Preludes that introduced many cartoons. Personally I find his quiet, introspective music much more interesting. The largely contemplative tone poem Orpheus was his son-in-law Richard Wagner's favourite for that reason, the two large scale sacred works, Via Crucis and Christus are some of Liszt's most daring and original compositions I've heard, and deeply moving. I also collected many reflective solo piano pieces in the playlist, like The Blessing of God in Solitude, The Fountain of the Villa d'Este and, of course, the majestic B Minor sonata, by some of the best Liszt interpreters like Claudio Arrau. Sadly Iren Marik was removed from Spotify after I made this playlist, I replaced her recordings with alternatives, and left her links there, let's hope Spotify brings them back soon.